One of the most important components to children functioning at their best in school and on the playground is proper nutrition. The Washington Post just reported on this subject, offering valuable tips and resources to ensure that your child gets the nutrition he/she needs. 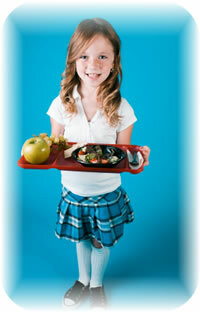 Children who eat healthy, satisfying dinners sleep better, and are more alert the following morning. And children who eat a balanced nourishing breakfast and lunch have better neurotransmitter activity and improved concentration during the day. Supplementation is also an important option to consider in children who are not getting the nutrition their brain and body need, particularly if they are challenged with Attention Deficit Hyperactivity Disorder or Autism Spectrum Disorder. This entry was posted on Thursday, August 28th, 2008 at 7:00 am and is filed under ADHD, Attention Deficit Hyperactivity Disorder, Autism, Childhood Nutrition, Diet and Disease. You can follow any responses to this entry through the RSS 2.0 feed. You can leave a response, or trackback from your own site. A good post indeed! That’s the sunny side of your writing, you write in a lucid manner and I have no no problem in understanding what you have said, even though I am a complete newbie. Keep the good work going by continue blogging new and entertaining posts. I have already subscribed to the RSS feed of your blog and look forward to reading more of your blog posts in the future.